This architecture practice is now titled Jahn, since 29 Oct 2012. 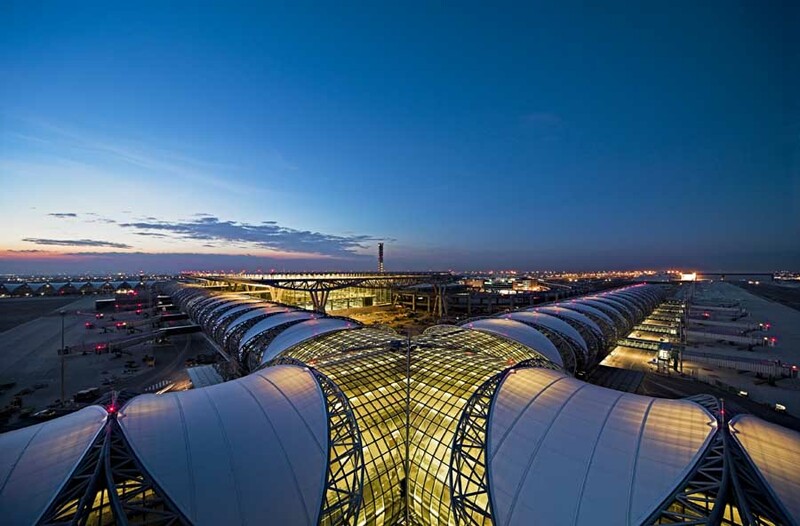 The passenger terminal complex at Suvarnabhumi Airport resulted from an International Competition and established the basis of collaboration between Werner Sobek, Matthias Schuler and Helmut Jahn. Chicago architect Gene Summers, 83, dies. Gene was an assistant to Mies ven der Rohe. He headed IIT’s College of Architecture. Gene worked with Mies on such celebrated projects as the Seagram Building in New York. Gene Summers was later partner in charge of design at C.F. Murphy Associates, where he was the chief architect of McCormick Place, completed in 1971. Summers started his own firm in 1966, hiring a young German architect – Helmut Jahn – who had come to Chicago to study at IIT. But then McCormick Place burned, prompting Summers and Jahn to join C.F. Murphy Associates, where they collaborated on the conventional hall’s replacement. February 11, 2010 in Architects.